UNAIR NEWS – Collaboration with Asian universities continues to be conducted by Universitas Airlangga. One of them is with ASEAN countries, Malaysia. 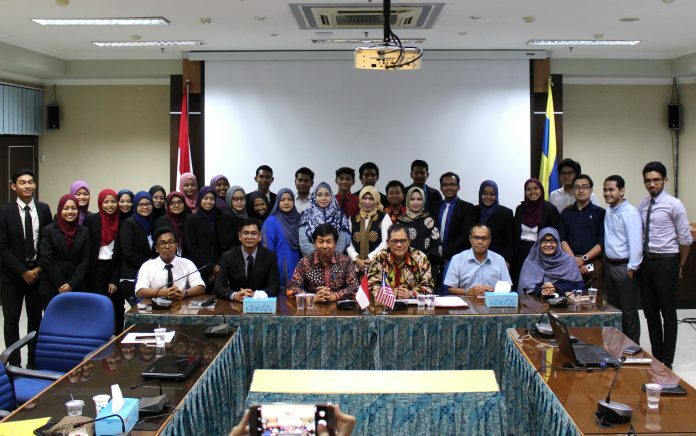 Together with UiTM (Universiti Teknologi MARA) Malaysia, UNAIR through the Faculty of Social and Political Sciences (FISIP) held an educational collaboration in form of 2018 inbound program. A total of 27 UiTM delegates attended the Welcoming Reception of Universiti Teknologi MARA (UiTM), Malaysia, at the Management Office, Campus C, UNAIR, on Tuesday afternoon, November 11. UNAIR Vice Rector I Prof. dr. Djoko Santoso, Ph.D., K-GH., FINASIM. ; Dean of FISIP Dr. Falih Suaedi, Drs., M.Sc . ; and Dian Ekowati,SE., M.Si., M.AppCom (OrgCh)., Ph.D., were also present at the event. Based on the agenda, UiTM sent a total of 27 delegates to FISIP. They consist of 3 lecturers and 24 students. Meanwhile, UiTM also sent 23 delegates to participate in Faculty of Vocational Studies activities. For FISIP, the program started on Saturday, 3 November untill Wednesday, 7 November, in a total of five days. In addition to the academic program at FISIP, the UiTM delegation also participated on outdoor activities program, such ascommunity service programs in Mangrove Wonorejo forest, introduction of historical sites in Surabaya, and Surabaya Public Service Mall visits, Siola. Including visiting the 112 Surabaya Command Center and the Co-working Space, a joint work space that aims to accommodate innovation and collaboration of creative young people in Surabaya. In this regard, Dr. Falih in his speech said that it was their second visit to FISIP. He said that it showed a strong desire between the two parties to strengthen cooperation and collaborationas an effort to improve the quality of each institution. “This visit also has strategic impact because we can run several programs. For example, student inbound, staff inbound, double degree exchange” he said. Meanwhile, Dr. Suhaimi Bin Hj Abd Samad in his speech expressed his welcome for the partnership that has been established. He considered the partnership is the right things to do. In addition, UNAIR is one of the best state universities in Indonesia. “Thank you for Dr. Falih, especially UNAIR. Hopefully in the future there will be more collaborative partnership, “he said. In response to UiTM’s visit, Prof. dr Djoko said that UNAIR gave an excessive portion for international programs. Universitas Airlangga is targeted to be among top 500 world class universities in the world. Prof. Djoko explained, currently UNAIR continues to strive international accreditation, precisely on programs. For example, ASIIN, AUN accreditation, and several other accreditations. He also revealed that UNAIR involved Malcolm Baldrige’s external audit related to management. To all participants, Prof. Djoko hoped other experiences outside academic affairs could also be learned. For example, socio-cultural community conditions in Surabaya is certainly different than in Malaysia. In addition, participants must be able to find the concepts of problems that exist while also finding solutions for it. More precisely, through new experiences and discussions during their visit in UNAIR. “With this kind of collaboration and collaboration, it is expected that both parties will be able to take advantage of each other and improved the quality and reputation of their campuses,” he said.